Aids in cellular detoxification. Also known to amplify, or activate, the effects of other supplements. Because of it’s powerful detoxing properties, gold water has been successfully used to treat addictions: cigarettes, drugs, sugar and other substances you want out of your system! We are taking gold to an entirely new level. Our negatively charged Nano Crystalline Gold particles are the most assimable form of gold ever discovered. Termed a mineral salt, these gold crystal particles will never fall out of solution and will never become toxic, and they can enter the cell and travel to the most remote parts of the body to turn on various bodily functions. 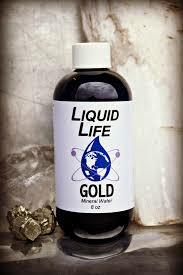 Liquid Life Gold is perhaps the best and fastest mineral for turning on the body’s ability to detoxify addictive substances, from simple sugars to alcohol, to tobacco, to the toughest and most addictive drugs. For maintenance, add 8 oz. 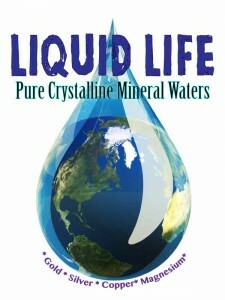 Liquid Life Gold to 1 gallon distilled water (MUST BE DISTILLED) and drink 4-8 oz. 1-2 times weekly; first thing in the morning. For therapeutic dose, add 8 oz. of Liquid Life Gold to one (1) gallon of distilled water (MUST BE DISTILLED). Drink 8-12 oz. per day first thing in the morning for 10 days as a therapeutic dose for chronic or acute conditions. Warning – Gold activates impurities and therefore CANNOT be added to tap, well or filtered water. It must be diluted only with distilled water. Never use Gold at full-strength dilution directly in the mouth.Note: Most water sources are H2O negative. Distilled water is H3O positive. It is said to leach minerals out of the body, but in reality it will only leach minerals that are too large for the body to use. Distilled water is safe to drink as long as you are getting adequate minerals in your diet and it can actually benefit you by pulling out excess heavy minerals that have accumulated in certain organs. It can therefore be useful in removing excess iron, copper or other heavy metals and can reduce prostate swelling and increase urine flow by removing calcium buildup in that organ.